Previously, Chord’s Qutest won the day against my Focusrite Clarett Pre 8, Audiolab’s M-DAC+, and Bluesound’s Node 2. After returning the M-DAC+ I just had the niggling to try the RME ADI-2 DAC. I didn’t really want to buy another DAC, and then have to send one back and go through the refund process again. And, anyway, I thought the Qutest was the one. The RME is quite a dinky box, a little bigger than the Qutest except in height, but substantially smaller than the M-DAC+. I plugged it straight in via the balanced XLR’s, and was pretty impressed. I played a bit of Little Feat. The drums were coming through with a nice punch and snappiness. My only criticism was that it sounded a little brash straight out the box. I left it playing for a few days, and when I came back to it I didn’t notice any harshness. The RME has several low pass filters, and the manual actually shows graphs and explains each one. I chose my preferred filter by listening and then later checked the manual. You get SD (short delay) Sharp, SD Slow, Sharp, Slow, NOS (No oversampling). I found Slow gave the most natural sound. The Qutest has Incisive, Incisive HF Roll off, Warm, Warm HF Roll off. I like Incisive and Incisive HF Roll off. I don’t use Incisive on rock music because I don’t think it sounds great with too much air, but for classical, acoustic based stuff, and even some dance/pop Incisive works for me. The RME has both RCA line level outputs and XLR balanced. Comparing the line-outs with the Qutest’s was easier. The Qutest works best on 3v in my system. To match the level the RME had to be +13dB and then -1dB on the digital volume. I made sure all other DSP was switched out; there is a lot on the RME. Listening over a number of genres I found the RME with Slow filter to be practically identical to the Qutest using it’s Incisive filter on 96khz material. Overall, perhaps the Qutest sounded a tad sweeter occasionally on acoustic guitars, and the output a little cleaner. Where it gets interesting is with the RME’s XLR outputs. The RME now had to be adjusted down to +7dB output level and again-1dB on it’s digital volume to match the levels. I found the sound was just so devoid of noise. Each instrument really had it’s own space. I don’t want to say ‘detailed’ because that implies something rather hifi-esque; and there wasn’t any more detail, it was just better defined, more so than the Qutest. The soundstage had a greater sense of depth. The music just seemed unwrapped more, inviting you in, whereas the Qutest had the front door open, but just left you outside looking in. I compared Led Zep’s “Good, Times, Bad Times” 96khz file. At the start you get the guitar hit, followed by hi-hat and cowbell, and John Bonham comes in with full kit and then doing his ultra fast bass drum pedal hits he is renowned for. The bass drum was just better defined on the RME. The toms had a bit more smack on them, everything had more focus, and the tail off reverb from Jimmy Page’s guitar at the beginning was very tight and clean. Moving onto “Babe, I’m Gonna Leave you.” I like using this track because you have the delicate acoustic guitar and vocal at the start and then it becomes an all out thrash. The questions posed are; How natural and intimate does Robert Plant sound? Does Jimmy Page’s acoustic guitar sound believable, and does it have all the rich harmonics? When the thrash starts that section can sound a bit thin and not as natural, especially with the Qutest Incisive mode. For this reason I used the Qutest’s Incisive HF Roll Off filter. I found the RME excellent on this album and it answered all the questions correctly. Robert Plant’s voice was more present, and consequently more realistic. The Qutest was good, but not as good for all the reasons above, and a little thin when the thrash started. I tried some classical. The Scottish Chamber Orchestra’s “Beethoven Piano Concertos 3, 4 & 5” 192khz, I found the piano to sound more real to my ears in the all important middle frequencies. Listening to Walter Susskind & The St. Louis Symphony Orchestra 1976 44.1khz CD rip of Holst’s “The Planets” the Qutest had more air, but switching back to the RME it was like a veil of noise had been removed. I haven’t played my classical albums for some time, but the RME really had me captivated. Rather than it merely being a homogenous orchestra, I could make out the cellos, and different textures of the violins and the definition of the timpani. It was like being seated very close to the orchestra, whereas with the Qutest I felt I was seated a few rows back. The front to back depth on the RME again showed itself to be just excellent. Everything I threw at it never disappointed, whether it be pop, rock, dance, or classical. Instruments and sounds had better separation, and in a natural way. Apart from the improved depth, etc. I found that the RME was just generally a little more forward in the middle frequencies, with less air. I preferred the RME’s presentation. The Qutest was starting to sound a bit ‘hifi’. By that I mean recessed mids and airy treble. Listening to Fleetwood Mac’s 96khz “Songbird” the presence of the vocal and the mids of the piano sounded right, with the vocal sitting just above the piano. On the Qutest the vocal was slightly back, which didn’t work as well for me. When I was listening to the SCO’s Beethoven 192khz there really seemed to be more noise/haze at the top end with the Qutest. I tried the Incisive HF Roll off and it was still there. The RME’s balanced outputs just seemed cleaner. When I had used the RME’s RCA line outputs I found the reverse to be true. My thoughts went to the 2Qute. I had bought an MCRU linear power supply second hand when I owned one. It had really improved the sound, although I still hadn’t liked it and had sold it on. I wasn’t going to buy an MCRU when it was looking increasingly likely the Qutest would be going back. I had watched DARKO’s review on the Qutest and he recommended the iFi iPower supply. I found it on Amazon for £49, so I thought I should give it a try. Once it arrived I plugged it in and I must say it did the job. The Qutest now had the same quality depth of field and clean output that RME had via balanced outs. I was so happy. I had spent another £50 to get the £1,200 Qutest to the same quality as the £850 RME ADI-2!! Ultimately though, I still preferred the presentation of the RME. The end? No, because there’s a whole other world with the RME. It’s EQ! I’m not a fan of tone controls. I like a plain amp with none of it. 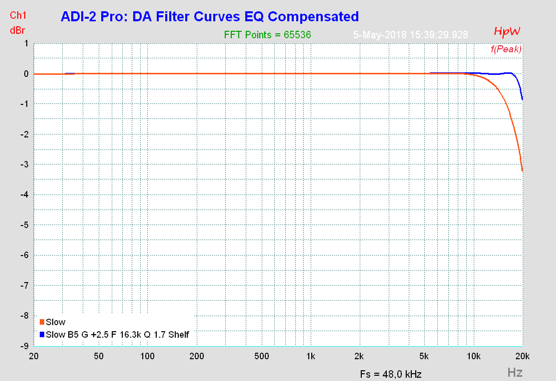 However, I have a couple of nasty bass peaks 56hz, and a big old lump between 115hz – 160hz; both about +6dB too loud. I’ve got quite a few acoustic panels in my listening / home cinema room, which are 100mm thick rock wool. However, they don’t touch the low stuff. I dialed in -5.5dB @ 56hz, -5.5dB @ 121hz, and -4dB@ 156hz, took a measurement. Lo and behold my bass peaks had dropped by the same amount. I was impressed because when I use my Velodyne SMS-1 subwoofer EQ and I take out -7dB @ 56hz it only diminishes it by about -3dB. I played some music post EQ, and although the bass was well controlled, it lacked fullness. It’s all relative. Take the bass away and your music will be brighter and harsher. I then halved the amounts and that was good, especially when you take into account the House Curve theory. The bass was so much more tuneful, and the older rock stuff still sounded full. I was just shocked how good a job it did. I tried performing measurements to check the midrange and top end at the listening position, but just couldn’t be 100% because of the slight variations in each reading from the effects of the room. I then placed the UMIK-1 15cm from the tweeter, and got no variation at all when I took multiple readings, so I felt I could now trust the readings. I think it helped that I had the 100mm rock wool panel next to the speaker. I used both 96khz and 44.1khz sweeps to test the effects of the filters at the two sample rates. The Qutest Incisive filter is pretty much bang on with the RME Slow filter using the 96khz sample rate. However, between 1.5khz and 3.2khz middle area the Qutest is down -¼ dB. Not much, but perhaps enough to make a tonal difference since it’s over an important area of the middle frequencies that cover guitar, vocals, snare drums, etc, etc. When the Incisive HF Roll off is engaged the HF on the Qutest begins to drop away slightly from about 9khz, and by 17khz - 20khz it is down -¾dB. 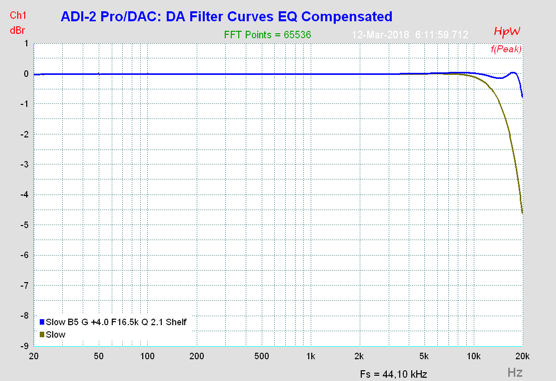 The Qutest Incisive at 44.1khz begins to fall away at 17khz compared to the same filter at 96khz, and by 20khz is -5dB in relation to it’s 96khz counterpart. Engaging the Qutest Incisive HF Roll off filter shows that it then begins to fall away earlier at around 11khz compared to the Incisive, and by 20khz is -6.5 dB down on the Incisive at 96khz. The RME at 44.1khz also begins to fall away at about 11khz and by 20khz is -10dB down compared to the Qutest incisive at 96khz, and -3.5dB lower than the Qutest HF Roll off at 44.1khz. The RME seems to have that little lift in the mids over the Qutest, and when it plays 44.1khz material the filter rolls off more of the high stuff. This really explains the less ‘noise’ and air I was hearing when switching between them on Walter Susskind’s rendition of "The Planets". I tried adding +1dB shelf EQ at 11khz on the RME, and to me it sounded pretty bang on to the Qutest Incisive. So, there is always that option if I do want some extra air. Less high stuff will often in turn project the mid range and bass forward. Therefore, less thin and a more full bodied sound, it's all relative. The Slow filter on the RME is the only one I like. Interestingly, the manual confirmed that likely to be one of the filters that would sound most natural, but at a cost of losing some very high top end, which I didn’t mind since I wanted less ‘air’. For me it was game over. The Qutest just can’t come back from that, especially when the RME is over £300 cheaper. So, if you don’t need to sort out your bass (although truth be told pretty much everyone does to varying degrees), and you have a Qutest you are happy with, then I would just recommend you try an iFi iPower adaptor. It’s £50 from Amazon and you can always send it back. It does look like RME have put a bit more effort into their power supply more than Chord. After the Chord Qutest winning my previous shoot-out, and then living with it for a week, I was feeling it was a tad too airy, and therefore slightly thin sounding. I didn’t like it on Jimi Hendrix “Band of Gypsys”, even using the HF Roll off filter. This prompted me to try the RME. I find the RME’s presentation to be better for my tastes and it’s got a host of really worthwhile features, many unmentioned here. Incredible for the money. On my system the balanced outputs on the RME sounded better. That may not be the case for everyone, and you may not have balanced inputs. In any case I think many would be hard pushed to differentiate the RME against the Qutest via RCA's, plus it's substantially cheaper. You may prefer the Qutest for it’s extra air and slightly less forward midrange. Considering the RME's EQ this DAC will take some beating. It will be interesting just to live with it for a bit now. Very nicely written, the RME ADI units are superb , I also use their ADI -PRO which is an A/D and D/A as you say their versatility is astounding. But you could not tell the difference under level matched blind testing......or not??? I don't have the ability to do proper blind testing, but I would say I heard differences, as mentioned. I then set out to see if there was a measurable reason for some of what I heard, and there was. Now if you really want to see what the RME can do use HQPlayer to up sample your files to DSD and put the DAC into DSD direct mode! Great write up Timbo, thanks for sharing. Excellent review Tim, great work. Did you try the ADI with the iFi power chord? I understand you did not try these using Tidal or Spotify? In tests balanced often come out better but I don't have on my system. Excellent write up really enjoyed reading Thanks. I'm getting a Qutest over the weekend to try again in my system against my 2Qute. First time I Compared was in a shop. One thing I have learnt over the years is system synergy is everything, of course within reason. Get that balance right and you laughing. If not satisfied with the improvement of the Qutest may give the RME ADI-2DAC a try also. I actually decided to give the Qutest another try on my system due to the £500 trade-in deal of a 2qute. Really looking forward to listening. Interesting. Might be the one dac that would change my mind that my Blusound node's is good enough. I don't suppose you've compared them? Yes, @Timbo21 this is what I am most interested in hearing about. I received an RME DAC today courtesy of Keith... won't be able to try it for a couple of days, but had a little look at it, looks a nice compact well made piece of kit, just the size I'm after, just have to wait and see how it sounds. Depends how revealing your system is. DAC's aren't like cartridges, which often have quite drastic differences. My second system is Arcam Alpha 8 with Kef 103.2 speakers, and I wouldn't consider anything more than the Node 2 because I know it's just not capable of showing the differences to any appreciable degree. I was using the Node 2 as a streamer into the RME, btw.